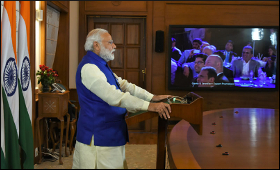 PM Narendra Modi addressing the International Diamond Conference in Mumbai through video conferencing, in New Delhi. Prime Minister Narendra Modi said on Sunday that India should become an international diamond trading hub in addition to its present status as cutting and polishing hub. He said: "India is now the world's largest manufacturer of cut and polished diamonds, and gems and jewellery sector is one of the leading sectors in India in terms of value of exports as well as employment generation. My intention is to make India, which is already the cutting and polishing hub, into an International Diamond Trading Hub"
Modi said India has emerged as the leader in diamond manufacturing and export in the last four decades and exports of gems and jewellery from India account for 15 percent of India's total merchandise exports.